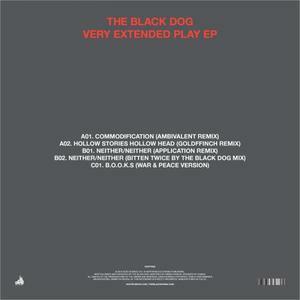 Sheffield veterans The Black Dog tap some of their favourite producers to remix tracks from their recent album. Ambivalent, who rose to fame during the minimal house boom, turns in a tough techno version of "Commodification", its tribal drums and growling bassline underpinning wild squeals and squeaks. By contrast, GoldFFinch's take on "Hollow Stories, Hollow Head" is a woozy affair, held together by a pulsing bass and lush strings. The Black Dog themselves also get in on the action, turning "Neither-Neither" into a tough stepper with a searing bass and ticking percussion, while the War & Peace version of "Books" is a balmy ambient affair.